Since Lent is one of my favorite seasons of the Liturgical Calendar, I have three new Lenten books for families to recommend and GIVEAWAY! Sarah Reinhard provides families with an aid in preparing our hearts for Easter. In “Welcome Risen Jesus – Lent and Easter Reflections for Families,” Sarah gives an exercise for each day of Lent that keeps our focus on the 3 pillars – prayer, fasting and almsgiving during this long season. As she explains – “spending forty days… in penitential mode is challenging,” and hopes this book will keep us engaged so we deepen our faith life as a family during the long Lenten season. Each day through Lent and into the first week of Easter, we are given a “Think, Act, Fast and Pray” action with direction. The actions are simple yet meaningful when placed with a reflection and prayer for the day. For example, on Tuesday, the first week of Lent, the Act: Recognize someone who has put God first with his very life by writing a thank-you letter or making a thank you card for a priest in your life. Fast: Give up playtime to do at least two helpful chores around the house. Pray: Jesus, show me how I can serve you better and make you number one in my life. 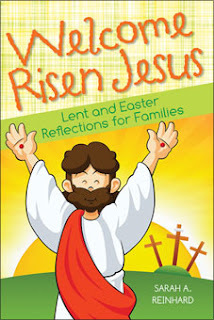 Welcome Risen Jesus shows children and families how they can put Lent into action in their day-to-day lives in a applicable, engaging and age appropriate way for young children. This extremely helpful Lenten resource will help make Lent more meaningful for the whole family as you approach and enter the Easter season. Do you have tweens through teens ask you, “Do I Really Have to Give Something Up for Lent?” Sarah Reinhard wrote an adorable little booklet perfect for answering that and other questions your child asks about Lent. This mini-book breaks down the pertinent points and explains the Lenten season in ordinary, easy to understand language while including scripture references for authority. 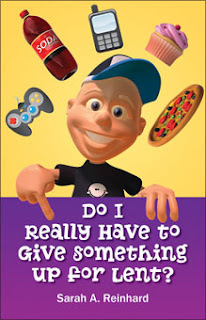 In “Do I Really Have to Give Something Up for Lent?” the explanations of the purpose of Lent, examples of sacrifices and suggestions of Lenten opportunities are thoughtful and targeted at older elementary age kids and up through teens or young adults. This mini booklet really packs a punch in its 24 small pages. It is the perfect size for even the reluctant preteen reader. Sarah has done such an excellent job at explaining Lent to adolescents and children that I recommend buying one for every child in your life. And you might be surprised by reading it yourself and enjoying it, as I did. The words of Mother Teresa are powerful. They reflect her deep faith, un-abiding service and complete sacrifice for others. Donna-Marie Cooper O’Boyle in her newest book “Bringing Lent Home with Mother Teresa: Prayers, Reflections, and Activities for Families ” couples the words, prayers and actions of Mother Teresa into a Lenten retreat for the whole family. Every day, the quote, reflection, prayer, story and action present a powerful message that can only lead you closer to God. Going through each day, you take on Mother Teresa’s mantle of doing small things with great love. For example, on the Thursday of the Second Week of Lent: Fasting: Suggest to the children that they fast today from unkind thoughts about others and from saying unkind things. Almsgiving: Ask the children to think about a gift they can give to the Blessed Mother today – a prayer, a gesture, an act of kindness, a sacrifice. I cannot imagine it possible to go through Lent praying with this book and remain the same person on Easter morning. Spending time with Mother Teresa humbles you before God and surrounds you in His love. I predict living Mother Teresa’s words during Lent will change your life. Donna, through the relationship she developed with Mother Teresa over 10 years, relates the words and stories of Blessed Teresa of Calcutta to our Lenten journey in a wonderful, personal way. Praying with this book during this 40-day retreat will bring you closer to the life of this Saint and deepen your faith life. FOUR copies of the booklet, Do I Really Have To Give Something Up for Lent? 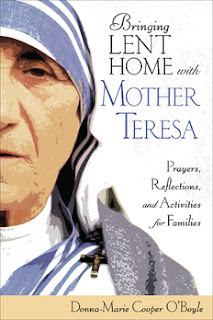 ONE copy of the book, Bringing Lent Home with Mother Teresa: Prayers, Reflections, and Activities for Families. Commenting on this post telling us how your family observes Lent together. Twitter - Link to this giveaway post and tag @SoundMindSpirit. Please use #CathMedia.